Over the years I’ve picked up several anthologies of his short stories and several of his novels. I’ve learned to trust his writing. Nobody comes close to his ability to deftly describe a character in a few pages and weave an interesting story. The Narrow Corner is a short novel from 1932. 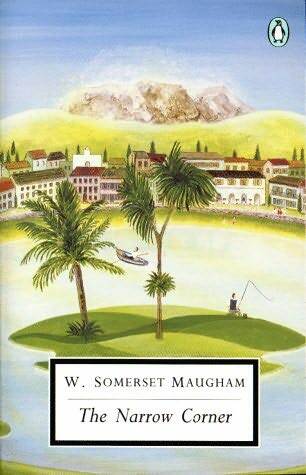 As with many of Maugham’s stories it takes place in “The South Seas” where the remnants of Western imperialism and colonialism have left a trail of personal and professional crises, tragedies, and drama. This story is no different. An English expatriate opium-smoking doctor is hired to treat an old patient. The treatment requires a sailing trip with a disreputable captain and mysterious passenger on a small shabby sailing vessel. They get to know each other on the voyage. They end up on an island where the colonial masters are eking out a business that has seen much better days. Naturally there is a beautiful young woman involved. Chaos and death follow. Parts of the story are vintage Maugham writing — the beauty of the tropics, fascinating personal details that must be based on real life memories, and exquisite attention to dialog and personality. There’s also a “hothouse” atmosphere towards the end of the novel where all emotional hell breaks loose; this does lack Maugham’s usual subtlety. But I’m not complaining. The Narrow Corner is a fun read.